President Muhammadu Buhari has said that his administration has learnt useful lessons on the dynamism of Nigerian society, saying ‘We needed to deploy our resources to address our common needs rather than the greed of a callous few’ The President said this on Sunday at the opening ceremony of the 2018 Nigerian Bar Association Annual General Conference. 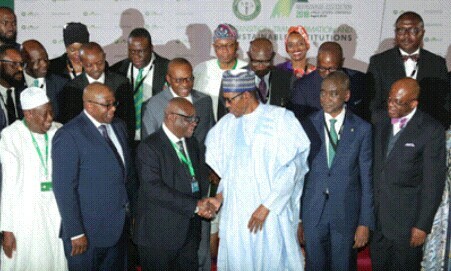 2.Front Roll; President Muhammadu Buhari in handshake with the Chief Justice of Nigeria, Hon Justice Walter Samuel Onnoghen, the outgoing NBA President Abubakar Balarabe Mahmoud SAN, Incoming NBA President Mr Paul Usoro SAN, Chairman NBA 2018 Technical Committee on Conference Planning and others during the 58th Nigerian Bar Association (NBA) Annual General Conference 2018 held at the International Conference Centre in Abuja. I am delighted to address this distinguished gathering on the occasion of the 2018 Annual Conference of the Nigerian Bar Association. Let me thank your Association for the invitation to declare this Conference open and to express my hope that the Conference will consolidate the position of the NBA as a prime stakeholder in our national affairs. I am informed that with an average attendance of over 10,000 participants, this Conference represents one of the largest single gathering of lawyers anywhere in the world. I congratulate you all for this achievement which is a plus for our nation. The theme of this 2018 NBA Conference — “Transition, Transformation and Sustainable Institutions” — is one which is apt in the light of our contemporary domestic and global challenges. I also consider it significant in view of the fact that it demonstrates the willingness of the NBA to address issues, not only related to the immediate practice of law but more importantly, to solutions of wider society’s problems. Since the inauguration of this administration, I have had the privilege of observing at first hand how societies experience transition, attempt transformation and build or strengthen institutions to manage these processes. As you will recall, this administration’s emergence marked the first successful civilian transition in Nigeria’s democratic history, following the outcome of the 2015 General Elections. Given the enormity of the challenges we inherited and the yearnings of a citizenry earnestly desirous of a new way of running national affairs, our first challenge was to transform our country speedily into a society where impunity in the management of national resources would be replaced with a culture of accountability and transparency. We needed to deploy our resources to address our common needs rather than the greed of a callous few. In order to achieve this, we have had to disrupt age-old assumptions and unsettle ancient norms in the management of our national patrimony, as you have all witnessed in the last three years. While we have made appreciable progress in several sectors, including public awareness of the need to challenge the corrupt and the brazen in our midst, we have also learnt useful lessons on the dynamism of our society. However, elements within every society, including some lawyers, can equally become unduly resistant to change, even where it is proven that such change is to serve the interest of the larger society. At worst, corruption fights back. As we gradually move into another season of intense political activities preparatory to the 2019 General Elections, I enjoin you to remember that by reason of your profession, you all have a responsibility to work for national cohesion and unity through your speeches and public positions and most importantly in your advocacy in court. In the context of opinions and narratives about our past and present political and socio-economic experience, you cannot afford to jettison rational and proper analysis of issues in a manner which builds, rather than destroys the nation. I also urge you to work to uphold and improve the sanctity and integrity of our judicial and electoral institutions which play a fundamental role in the sustenance and growth of our democracy. However, let me remind you all, my dear compatriots, that the law can only be optimally practiced in a Nigeria that is safe, secure and prosperous. As you go into this Annual Conference, let me assure you of the resolve of this administration to promote measures that will achieve a vibrant economy under which the practice of law will thrive. Through fiscal discipline, good housekeeping, we navigated the difficult days of economic transformation at the beginning of this Government in 2015 and have now come to improving economic indices, including the consistent increase in our foreign reserves; thirteen straight months of decreasing inflation; the expansion of social safety nets programmes as well as the blockages of historical drain pipes in our national treasury, all within the context of the Economic Recovery and Growth Plan. It is equally significant to emphasize that our willingness to hold persons accountable for offences against society, through the judicial process, will equally transform the future of public service in Nigeria in a positive manner. I believe that lawyers can contribute to another core objective of enhancing our business environment and promoting social justice by promoting respect for the Rule of Law; contributing to the law reform process and putting national interest and professional ethics above self in the conduct of their business Rule of Law must be subject to the supremacy of the nation’s security and national interest. Our apex court has had cause to adopt a position on this issue in this regard and it is now a matter of judicial recognition that; where national security and public interest are threatened or there is a likelihood of their being threatened, the individual rights of those allegedly responsible must take second place, in favour of the greater good of society. I trust that this Conference will achieve tremendous success and I urge you all to participate actively in its various intellectual and social activities in order to build new bonds and strengthen old relationships. I congratulate the incoming National Executive of the NBA led by Mr. Paul Usoro, SAN, and wish them a successful tenure in the task of advancing legal practice in Nigeria. In conclusion, may I wish you all, once more, a very fruitful Conference. It is my hope that the outcome of your deliberations will impact positively on the socio-economic fortunes of our country and Africa in the years ahead and improve access of the poor and under-privileged in our society to justice. I look forward to reading the conclusions of your conference. Your Excellencies, My Lords, Distinguished Ladies and Gentlemen of the Bar, it is now my pleasure to declare the 2018 Annual Conference of the Nigerian Bar Association open. Thank you and God bless the Federal Republic of Nigeria. Previous articleEnugu state Keke Operators Union debunks campaign of calumny against gov Ugwuanyi.